Broken garage door torsion springs are one of the most common repairs to garage doors. Torsions springs are responsible for counterbalancing the weight of the garage door. Garage doors can weigh up to 400 pounds or more. Ponderosa Garage Doors & Repair recommends that ALL of your garage door components, including torsion springs, be inspected on an annual basis. However, if you suspect that any of your garage door components are in need of repair please consult a professional garage door repair specialist. 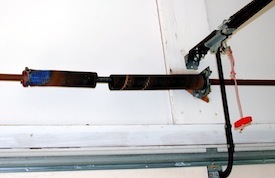 The most dangerous garage door component is the torsion spring. Your home’s garage door is most likely the single largest mechanical device. Keep yourself and your family safe. Have ALL of your garage door components inspected annually.